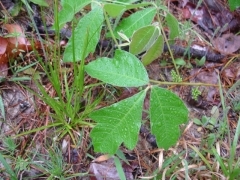 People who knock around in the woods are aware of poison ivy, Toxicodendron radicans, but they often have problems correctly identifying the ubiquitous plant. They may know that it has three leaves, but I find they confuse it with everything from Virginia creeper, Parthenocissus quinquefolia, to peppervine, Ampelopsis arborea. 1. Poison ivy, Toxicodendron radicans: A vine in our region (bushy in the north and northeast) that has leaflets in groups of three; the middle leaflet has notched margins and a rather pointed tip, and the other two leaflets have notched margins with one lobe a bit elongated near its base resembling a thumb sticking up from a hand. 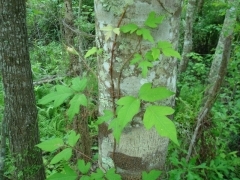 The vines typically climb trees and they produce small brown rootlets that grasp the tree’s bark. As the plant ages, the leaflets may become quite large and extend a considerable distance from the tree trunk, actually making the observer think they are the leaves of the tree. Although they drop their leaflets in winter, the leaflets may fall long after the tree leaves around them, so one may see an interesting leafed tree that, upon closer inspection, is a tree with a heavy growth of poison ivy. Since they most often climb trees, poison ivy plants are most often found in forest understories or along trails. 2. Poison oak, Toxicodendron quercifolia (you may see it as T. pubescens and possibly other names): This species grows upright, eventually as a bush (on the U.S. west coast it climbs trees like our poison ivy), may cover the ground, and has leaflets in groups of three, but with the “thumbs” referenced for poison ivy either absent or not as pronounced. Each leaflet is generally partially crenate (rounded toothed) and resembles certain oak leaves, hence the name. Young plants have very green, supple leaves; as they age, the leaflets stiffen and exhibit a yellowish color. Poison oak is more of a forest edge species. 3. Poison sumac, T. vernix: This species has a shrubby growth form not unlike a holly or yaupon. 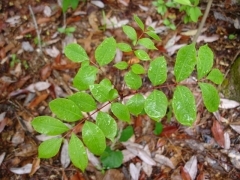 The new stems and leaf rachises are red, and the leaves are pinnately compound. Each leaflet has smooth edges and a nice drip tip, and leaflets are opposite one another along the rachis. As they age, the red softens a bit, but retains those color qualities to a varying extent. They may easily be distinguished from real sumacs (genus Rhus) when reproductive by having green berries hanging down instead of the typical sumac berries that are red and stand upright. Poison sumac prefers moist areas, and is more common near swamps, lakes, and along seeps. 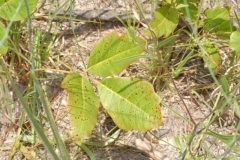 Along our coast, poison ivy is the most abundant of the three species described above. The woods are full of it, and it is guaranteed to be present in public parks and will pop up in yards. They all cause the same reaction, allergic contact dermatitis, and all have the same active ingredient, urushiol, an oily sap that is present in all parts of the plant. Some people are so sensitive to urushiol that slight contact causes dermatitis, even from dry plant parts. Exposure may happen by merely brushing against the plant, pulling up the plant while weeding, touching tools that have contacted the plant, or even petting a dog that has been running through the bush. Seventy-five per cent of the human population has reactions to urushiol, and the extent of severity varies widely. Symptoms range from minor rashes, appearance of little bumps called papules, fluids oozing from irritated skin, or blistering. These may represent a progression of symptoms, or all may exist at the same time. Although all of these may be uncomfortable, they usually subside within days or weeks at most, with rare exceptions. The most dangerous form of exposure comes with breathing smoke that contains urushiol. This should be considered a medical emergency, since mucous membranes in sinuses, the throat, and lungs are exposed and this situation can be life threatening. It is commonly thought that the effects spread by contact with oozing fluids or rashes. Actually, it is only spread if urushiol on the sufferer is transmitted to others by touch. Some parts of the body may take longer to show signs after exposure, so one may think it is being spread from papules and blisters when it is really the urushiol still present on neighboring anatomy. So, what are we to do, short of never entering the woods, parks, or our yards? 1. Learn to recognize our poisonous species and stay on the look out. 2. When in the woods, keep arms and legs covered and tuck pant bottoms in socks. Handle clothing with care when you return and wash them. 3. Remove urushiol plants from your property and have it removed from parks where practical. 4. Keep pets and other family from running the woods. A better idea is to encourage them to enjoy the out-of-doors and bathe them on their return. What should you do if you come in contact with poisonous plants? 1. Wash exposed body parts with cool water and soap. Clean well, even under nails and your hair. 2. Clean any items that may have come in contact with the plants, such as tools, toys, etc. 3. Bathe exposed pets, kids, spouses, friends, etc. 4. VERY IMPORTANT: Go to a doctor if you have trouble breathing, you experience mucous membrane irritation, you breathe smoke, more than a quarter of the body shows symptoms, or there is infection. 5. If you have normal reactions (itching, papules, etc. ), use calamine lotion or Tecnu (recommended by naturalist Irene Brady) liberally. Severe cases will require prescriptions. Some people have reactions to plants that most of us consider innocuous. I have often heard of people getting itchy rashes after contact with trumpet creeper, Campsis radicans, but symptoms are said to be short-lived and this common vine has no affect on me. Plants like the aforementioned Virginia creeper contain oxalate crystals, but it is rare that someone has a reaction. There are other plants in the U.S. that cause allergic contact dermatitis. 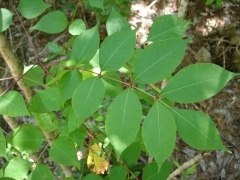 Florida has Poisonwood, Metopium toxiferum, a relatively common species from the Caribbean rim. Although I don’t worry about the poisonous plants in coastal Louisiana, I am sensitive to poisonwood and often get rashes or blisters around my ankles when traipsing about in Belize. 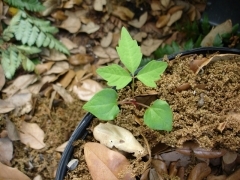 The good news about poisonwood is that it normally grows next to its natural antidote, gumbo limbo, Bursera simaruba. The fluid from boiled gumbo limbo bark poured over poisonwood rash results in rapid healing. I wish we had such an antidote for our local poison plants. Well, we do, but most of us just don’t know enough about herbal healing. Two plants that can be crushed and rubbed on the Toxicodendron rash are jewelweed, Impatiens wallerana, and plantain, Plantago major. I’ll have to consult a local traiteur or one of my Native American friends to find local remedies. and is a vine. Where the vines climb a flower pot in my yard. trees, they characteristically have tiny Photo by Bob Thomas. poison ivy. The leaflets, however, are less supple, and a bit more yellowish. resemble some species of oak trees and Photo by Bob Thomas. they are shrubby instead of being vines. obviously red stems and rachises (to which and rachises are still reddish. the leaflets are attached). They prefer wet Photo by Bob Thomas. areas, including seeps in the forest.